The Angsana trees are in flowering mode right now in Bintulu. 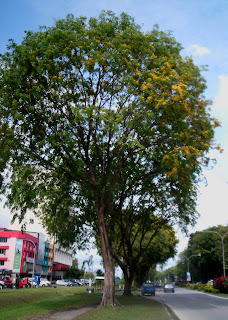 Bintulu has a total stretch of 25 kilometers of these huge ,compact and spreading canopies of lush green leaves since they were planted some 25 years ago, in a bid to catch up with the fever of urban landscaping comparable with major towns like Kuching (then but now a city). Angsana flowers are fragrant, bright yellow in colour and last only a day, after which they fall off to the ground leaving a carpet mass of yellow flowers.